It’s time to whip out your 3-D glasses to enjoy and scrutinize the remarkable detail of spectacular terrain revealed in a new high resolution stereo image of Pluto – King of the Kuiper Belt! – taken by NASA’s New Horizons spacecraft. The amazing new stereo Plutonian image focuses on an area dominated by a mysterious feature that geologists call ‘bladed’ terrain – seen above – and its unlike anything seen elsewhere in our solar system. Its located in a broad region of rough highlands informally known as Tartarus Dorsa – situated to the east of the Pluto’s huge heart shaped feature called Tombaugh Regio. The best resolution is approximately 1,000 feet (310 meters). The stereo view combines a pair of images captured by New Horizons Ralph/Multispectral Visible Imaging Camera (MVIC) science instruments. They were taken about 14 minutes apart on during history making first ever flyby of the Pluto planetary system on July 14, 2015. The first was taken when New Horizons was 16,000 miles (25,000 kilometers) away from Pluto, the second when the spacecraft was 10,000 miles (about 17,000 kilometers) away. The blades align from north to south, typically reach up to about 550 yards (500 meters) high and are spaced about 2-4 miles (3-5 kilometers). Thus they are among the planets steepest features. They are “perched on a much broader set of rounded ridges that are separated by flat valley floors,” according to descriptions from the New Horizons science team. In the companion global image from NASA (below), the bladed terrain is outlined in red and shown to extend quite far to the east of Tombaugh Regio. The composite image was taken on July 13, 2015, the day before the closest approach flyby, when the probe was farther away thus shows lower resolution. It combines a pair of images from two of the science instruments – a Ralph/Multispectral Visible Imaging Camera (MVIC) color scan and an image from the Long Range Reconnaissance Imager (LORRI). This global view of Pluto combines a Ralph/Multispectral Visible Imaging Camera (MVIC) color scan and an image from the Long Range Reconnaissance Imager (LORRI), both obtained on July 13, 2015 – the day before New Horizons’ closest approach. The red outline marks the large area of mysterious, bladed terrain extending from the eastern section of the large feature informally named Tombaugh Regio. The MVIC scan was taken from a range of 1 million miles (1.6 million kilometers), at a resolution of 20 miles (32 kilometers) per pixel. The corresponding LORRI image was obtained from roughly the same range, but has a higher spatial resolution of 5 miles (8 kilometers) per pixel, say officials. Scientists have developed several possible theories about the origins of the bladed terrain, including erosion from evaporating ices or deposition of methane ices. Measurements from the Linear Etalon Imaging Spectral Array (LEISA) instrument reveal that that this region “is composed of methane (CH4) ice with a smattering of water,” reports New Horizons researcher Orkan Umurhan. But the question of whether that methane ice is strong enough to maintain the steep walled snakeskin features, will take much more research to determine a conclusive answer. Pluto continues to amaze and surprise us as the data streams back to eagerly waiting scientists on Earth over many more months to come – followed by years and decades of painstaking analysis. The Kuiper Belt comprises the third and outermost region of worlds in our solar system. Charon suffered such a surprisingly violent past of titanic upheavals that they created a humongous canyon stretching across the entire face of Pluto’s largest moon – as revealed in a fresh batch of images just returned from NASA’s New Horizons spacecraft. We have been agog in amazement these past few weeks as New Horizons focused its attention on transmitting astounding high resolution imagery and data of Pluto, captured during mankind’s history making first encounter with our solar systems last unexplored planet on July 14, 2015, at a distance of 7,750 miles (12,500 kilometers). not disappoint and is no less exciting than the “snakeskin texture mountains” of Pluto revealed only last week. “You’ll love this,” said New Horizons Principal Investigator Alan Stern of the Southwest Research Institute, Boulder, Colorado, in a blog posting. “We thought the probability of seeing such interesting features on this satellite of a world at the far edge of our solar system was low,” said Ross Beyer, an affiliate of the New Horizons Geology, Geophysics and Imaging (GGI) team from the SETI Institute and NASA Ames Research Center in Mountain View, California, in a statement. Measuring 754 miles (1,214 kilometers) across, Charon is half the diameter of Pluto and forms a double planet system. Charon also ranks as the largest satellite relative to its planet in the solar system. By comparison, Earth’s moon is one quarter the size of our home planet. The new images of the Pluto-facing hemisphere of Charon were taken by New Horizons’ Long Range Reconnaissance Imager (LORRI) and the Ralph/Multispectral Visual Imaging Camera (MVIC) during the July 14 flyby and downlinked over about the past week and a half. They reveal details of a belt of fractures and canyons just north of the moon’s equator. The “Grand Canyon of Charon” stretches more than 1,000 miles (1,600 kilometers) across the entire face of Charon visible in the new images. Furthermore the deep canyon probably extends onto the far side of Pluto and hearkens back to Valles Marineris on Mars. “It looks like the entire crust of Charon has been split open,” said John Spencer, deputy lead for GGI at the Southwest Research Institute in Boulder, Colorado, in a statement. Charon’s “Grand Canyon” is four times as long as the Grand Canyon of the United States. Plus its twice as deep in places. “These faults and canyons indicate a titanic geological upheaval in Charon’s past,” according to the New Horizons team. The southern plains are informally named “Vulcan Planum” and may be much younger. “The team is discussing the possibility that an internal water ocean could have frozen long ago, and the resulting volume change could have led to Charon cracking open, allowing water-based lavas to reach the surface at that time,” said Paul Schenk, a New Horizons team member from the Lunar and Planetary Institute in Houston. The piano shaped probe gathered about 50 gigabits of data as it hurtled past Pluto, its largest moon Charon and four smaller moons. Barely 5 or 6 percent of the 50 gigabits of data captured by New Horizons has been received by ground stations back on Earth due to the slow downlink rate. Stern says it will take about a year for all the data to get back. Many astounding discoveries await. “I predict Charon’s story will become even more amazing!” said mission Project Scientist Hal Weaver, of the Johns Hopkins University Applied Physics Laboratory in Laurel, Maryland. The more we learn about Pluto, the weirder and weirder it gets. The newest batch of high resolution Plutonian images has yielded “astonishing” discoveries of previously unseen ‘snakeskin’ textured mountains, that are simultaneously “dazzling and mystifying” scientists analyzing the latest data just returned from NASA’s New Horizons spacecraft. 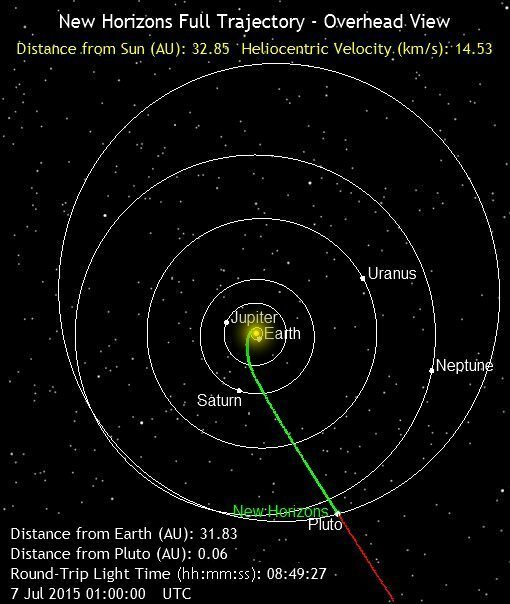 New Horizons swooped past the Pluto planetary system during mankind’s history making first encounter on July 14, 2015 at a distance of 50,000 miles (80,000 kilometers). Data from that priceless, once in a lifetime flyby is now trickling back to Earth. The ‘snakeskin’ feature on Pluto’s utterly bizarre surface was unveiled to “astonished” scientists scrutinizing the latest data dump received over the past week, that included images taken by the Ralph instruments Multispectral Visual Imaging Camera (MVIC). Features as small as 0.8 miles (1.3 kilometers) are resolved in detail. The MVIC image stretches about 330 miles (530 kilometers) across the ‘snakeskin’ like landscape composed of rounded and bizarrely textured mountains that are informally named Tartarus Dorsa and that borders the bodies day-night terminator. It shows intricate patterns of blue-gray ridges and reddish material in between that are puzzling researchers. “It’s a unique and perplexing landscape stretching over hundreds of miles,” said William McKinnon, New Horizons Geology, Geophysics and Imaging (GGI) team deputy lead from Washington University in St. Louis. The Ralph/MVIC image is actually a composite of blue, red and infrared images. The image of Tartarus Dorsa reveals a “multitude of previously unseen topographic and compositional details. It captures a vast rippling landscape of strange, aligned linear ridges that has astonished New Horizons team members,” say officials. Another wider angle global view of Pluto downlinked on Sept. 19 shows a new “extended color” view of Pluto with an the extraordinarily rich color palette of the planet. “We used MVIC’s infrared channel to extend our spectral view of Pluto,” said John Spencer, a GGI deputy lead from Southwest Research Institute (SwRI) in Boulder, Colorado. The image resolves details and colors on scales as small as 0.8 miles (1.3 kilometers). Beyond MVIC, additional new images taken by New Horizons’ narrow-angle Long Range Reconnaissance Imager (LORRI) during the July 14 were downlinked on Sept. 20. They focus on the Sputnik Planum ice plains on the left side of the famous heart shaped Tombaugh Regio feature and are the highest resolution yet – as seen below. The team added color based on the global MVIC map shown above. Barely 5 or 6 percent of the 50 gigabits of data captured by New Horizons has been received by ground stations back on Earth. “With these just-downlinked images and maps, we’ve turned a new page in the study of Pluto beginning to reveal the planet at high resolution in both color and composition,” added New Horizons Principal Investigator Alan Stern, of SwRI. Stern says it will take about a year for all the data to get back. Thus bountiful new discoveries are on tap. Imagine yourself as a once in a lifetime Plutonian tourist sailing along in a spartan spaceship and looking out the windows to breathtaking alien landscapes with cameras snapping away. Now for the first time in human history, you can embark on a heretofore unimaginable flyover tour over Pluto – the most distant planetary system yet explored by an emissary from Earth, thanks to the team propelling NASA’s New Horizons spacecraft to the far flung reaches of our Solar System. Just click on the video above and take the astounding aerial flyover tour above Pluto’s huge heart and the icy worlds wondrous array of tectonically active flow plains and majestic mountain ranges towering kilometers skyward to its thin hazy atmosphere. The animation is a gift to humanity as seen from the perspective of the New Horizons probe as it flew past Pluto on July 14, 2015 at a distance of 50,000 miles (80,000 kilometers). The new flyover video beautifully melds “art and science” – and is the brainchild of Stuart Robbins, a New Horizons research scientist at the Southwest Research Institute in Boulder, Colorado. “I have used the latest images to produce an animation that shows what it might be like to take an aerial tour through Pluto’s thin atmosphere and soar above the surface that New Horizons explored,” Robbins explained in a blog posting. 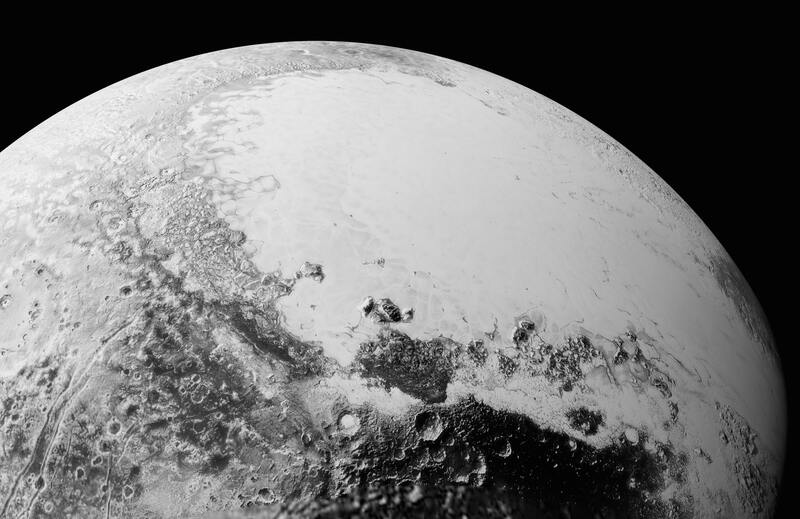 The flyover animation is based on a stitched together mosaic of New Horizons images that were then rendered onto a sphere of Pluto. The animation and spherical mosaic were created by New Horizons team members using the initial batch of images taken by the LORRI (Long Range Reconnaissance Imager) camera and downloaded from the spacecraft as of Sept. 11, 2015. 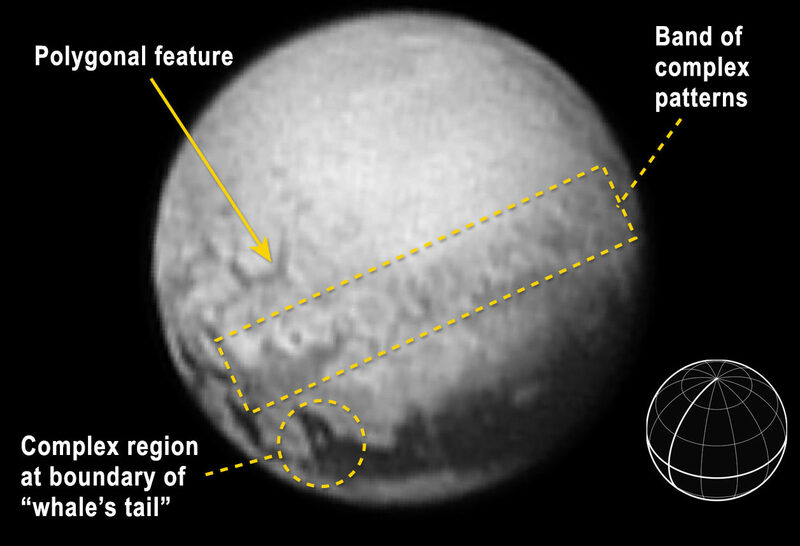 The flyover begins low over the heart shaped region of Pluto informally named Tombaugh Regio by the New Horizons team. The LORRI images at the starting point over the Norgay Montes mountain range have a resolution up to 400 meters per pixel at a altitude of only about 120 miles (200 kilometers). The resolution then changes to about 800 meters per pixel. The animation concludes with images of approximately 2.1 kilometers per pixel as the apparent altitude increases tenfold to about 1,500 miles (2,500 kilometers) as viewers perspective changes from an up close view to one revealing Pluto’s disk rapidly growing to show about 80% of the hemisphere New Horizons flew closest to on July 14, 2015. To see and study the whole disk of Pluto and the highest resolution view of the “heart” check out our global Pluto and Tombaugh Regio mosaics generated from raw images captured by New Horizons’ Long Range Reconnaissance Imager (LORRI) and stitched together by the image processing team of Marco Di Lorenzo and Ken Kremer. New Horizon’s unveiled Pluto as a surprisingly vibrant and geologically active “icy world of wonders” as it barreled past the Pluto-Charon double planet system on July 14 at over 31,000 mph (49,600 kph) and collected unprecedented high resolution imagery and spectral measurements of the utterly alien worlds. What are Pluto’s newly discovered plains and mountains composed of? “The plains are made of nitrogen. But nitrogen is too soft a material to build mountains out of, even in Pluto’s weak gravity,” says New Horizons Principal Investigator Alan Stern of the Southwest Research Institute, Boulder, Colorado. Here’s our colorized and annotated version of the recently released backlit view of Pluto taken 15 minutes after closest approach as New Horizons spacecraft looked back toward the sun and captured a near-sunset view of the rugged, icy mountains and flat ice plains extending to Pluto’s horizon. Since the flyby, the team has been busy analyzing the science data returned thus far and “making some discoveries” says Stern. New Horizons gathered about 50 gigabits of data as it hurtled past Pluto, its largest moon Charon and four smaller moons. New Horizons also discovered that Pluto is the biggest object in the outer solar system and thus the ‘King of the Kuiper Belt’. Only about 5 to 6 percent has been downlinked to Earth so far. Stern says it will take about a year for all the data to get back. So expect a year of endless treats and surprises from the ‘King of the Kuiper Belt’! 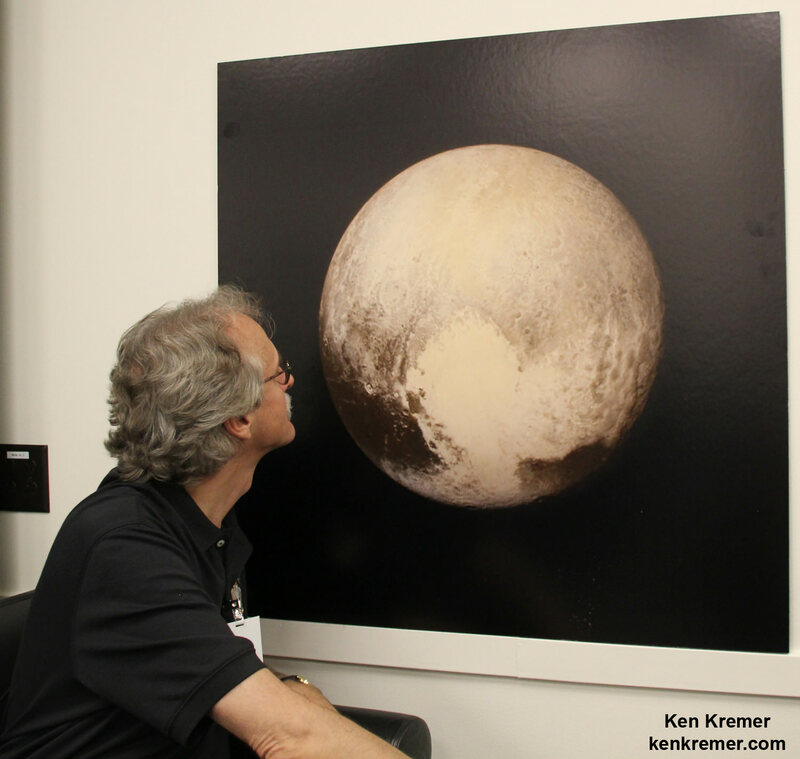 Watch for Ken’s continuing coverage of the Pluto flyby. He was onsite reporting live on the flyby and media briefings for Universe Today from the Johns Hopkins University Applied Physics Laboratory (APL), in Laurel, Md. A new global mosaic of Pluto created from the latest high resolution images just beamed back from NASA’s New Horizons probe reveals a bewildering diversity of planetary landforms with unimaginable complexity – yielding undreamed of science discoveries. But because of limited bandwidth the new image data sets were stored onboard the probe until days ago when they were transmitted back to Earth and released by the New Horizons team late in the day on Friday, Sept. 11. This best yet view of far flung Pluto comes from raw images taken as New Horizons conducted the history making first flyby past Pluto on July 14, 2015, at a distance of 50,000 miles (80,000 kilometers). The global Pluto mosaic was generated from over two dozen raw images captured by New Horizons’ Long Range Reconnaissance Imager (LORRI) and stitched together by the image processing team of Marco Di Lorenzo and Ken Kremer. See also our expanded hi res Tombaugh Regio mosaic below showing features as small as 0.5 miles (0.8 kilometers) in size. After transmitting carefully selected high priority images and science measurements across over 3 billion miles (about 5 billion kilometers) of interplanetary space in the days around the history making flyby, the team elected to temporarily pause the transmission of new images for several weeks in favor of sending other data important for helping place the entire Pluto planetary system into context. Altogether, over 50 gigabits of data were collected during the July 14 encounter and flyby periods of the highest scientific activity – which includes the most critical hours before and after the spacecrafts closest approach to Pluto, its largest moon Charon and its quartet of smaller moons. Data from the flyby continues streaming back to Earth, but rather slowly due to limited bandwidth amounting to an average “downlink” of only about 2 kilobits per second via its two transmitters. New Horizon’s unveiled Pluto as a surprising vibrant and geologically active “icy world of wonders” as it barreled past the Pluto-Charon double planet system on July 14 at over 31,000 mph (49,600 kph) and collected unprecedented high resolution imagery and spectral measurements of the utterly alien worlds. Since the flyby, the team has been busy analyzing the science data returned thus far and “making some discoveries” said New Horizons Principal Investigator Alan Stern of the Southwest Research Institute, Boulder, Colorado, during the Weekly Space Hangout on Sept 11. The team is ecstatic with all the new images and created what they call a synthetic global view of a portion of Pluto. Each LORRI frame is about 400 km across. What are Pluto’s plains and mountains comprised of? “We’ll see when we have more data!” exclaimed Stern. “Over 50 gigabits of science data from the Pluto system needs to be sent back. The Pluto flyby took place on the 50th anniversary of NASA’s first flyby of Mars by Mariner IV. New Horizons dataset amounted to several thousand times more data collected compared to what Mariner IV sent back during its first flyby of Mars,” Stern elaborated. How much data has been returned so far varies by instrument. “The average across all the entire science payload is only about 5 or 6 percent so far,” Stern explained. Stern informed that the team has submitted a paper to the journal Science and plans a large series of technical scientific presentations at upcoming meetings, including the Division of Planetary Sciences Meeting in Washington in November. And New Horizons is in excellent shape to get those 50 gigabits of data back to the eagerly waiting researchers since all the spacecraft systems are operating normally. “The spacecraft is doing very well,” said Alice Bowman, New Horizons Mission Operations Manager of the Johns Hopkins University Applied Physics Laboratory (APL), during the Weekly Space Hangout. As of today, Sept. 14, New Horizons is 2 months past the Pluto flyby and already over 73 million kilometers ( over 45 million miles) beyond Pluto and continuing its journey into the Kuiper Belt, the third realm of worlds in our solar system. The science team plans to target New Horizons to fly by another much smaller Kuiper Belt Object (KBO) in 2019 after recently selecting the object dubbed PT1, for Potential Target 1, based on images taken by NASA’s Hubble Space Telescope. “Since the flyby, we have been planning for the extended mission which we will propose to NASA next year,” Stern explained. NASA will then decide whether to approve and fund the new KBO mission proposal. The actual flyby distance of New Horizons from the KBO is yet to be determined. Stern thinks it could perhaps be much closer, but all those details still need to be worked out. APPLIED PHYSICS LABORATORY, LAUREL, MD – The highest resolution images ever taken of Pluto by humanity’s first spacecraft ever to visit the last planet in our solar system revealed unanticipated new discoveries of ice mountains as tall as the Rockies and vast craterless plains spanning hundreds of miles (kilometers) across – are now shown in our newly created context mosaic (featured above and below) of the heart-shaped ‘Tombaugh Regio’ area that dominates the alien planet’s surface. These stunning and astoundingly young features only now unveiled on Pluto’s surface were created in very recent times, geologically speaking said top scientists leading NASA’s resounding successful New Horizons mission, at a media briefing on July 17. They were captured by New Horizons’ high resolution Long Range Reconnaissance Imager (LORRI) on July 14 as the probe barreled past the Pluto-Charon binary planet system only four days ago on Tuesday, July 14, at over 31,000 mph (49,600 kph). These highest resolution LORRI images focused on the “Heart of the Heart” of Pluto have now been stitched into a mosaic by the image processing team of Marco Di Lorenzo and Ken Kremer. Pluto’s bright heart-shaped region has now been informally renamed “Tombaugh Regio,’ announced John Spencer, New Horizons science team co-investigator at the post flyby media briefing on July 15. 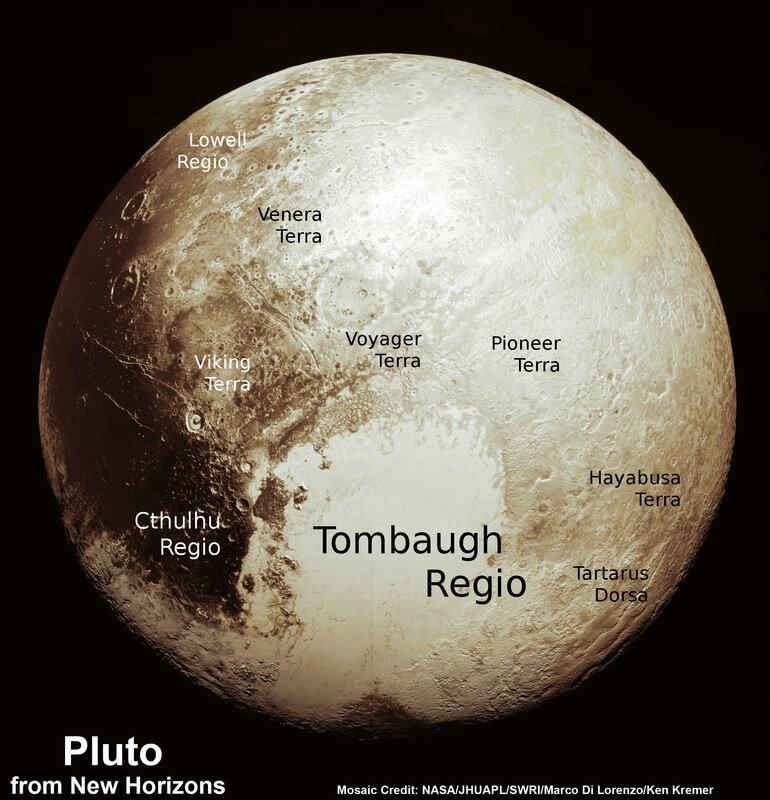 The mosaic of Pluto’s ‘Tombaugh Regio’ is based on the initial imagery released so far as of July 17. A pair of high resolution LORRI images was aimed at areas now informally named Norgay Montes (Norgay Mountains) and Sputnik Planum (Sputnik Plain). Norgay Montes is informally named for Tenzing Norgay, one of the first two humans to reach the summit of Mount Everest, along with Sir Edmund Hillary. Sputnik Planum is informally named for Earth’s first artificial satellite launched by the Soviet Union in 1957. 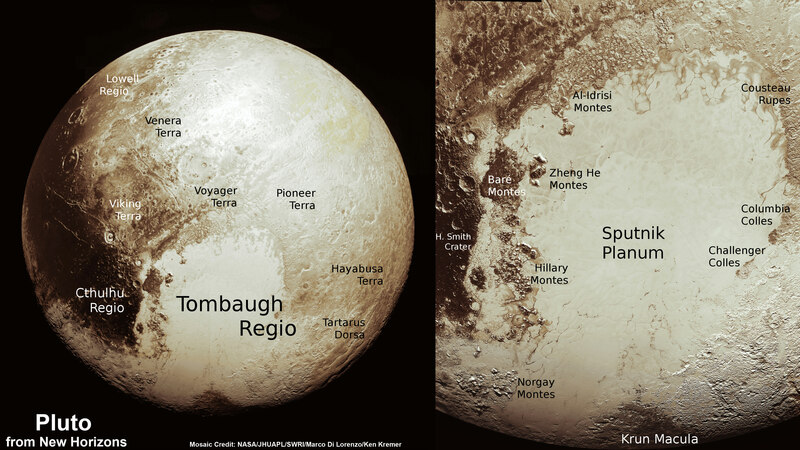 The two LORRI images are draped over a wider, lower resolution view of Tombaugh Regio – in annotated and unannotated versions. This is highest resolution currently available. To the left of the mosaic are two small inserts showing possible “wind streaks” say the researchers. To the right of the mosaic is a global view of Pluto showing the location of Tombaugh Regio and also outlined to show the precise location of the high resolution LORRI mosaic. The LORRI images were taken from a distance of 48,000 miles (77,000 kilometers) from the surface of the planet about 1.5 hours prior to the closest approach at 7:49 a.m. EDT on July 14. The images easily resolve structures smaller than a mile across. The frozen region of Norgay Montes is situated north of Pluto’s icy mountain range at Sputnik Planum. “This terrain is not easy to explain,” said Jeff Moore, leader of the New Horizons Geology, Geophysics and Imaging Team (GGI) at NASA’s Ames Research Center in Moffett Field, California. ‘Sputnik Planum’ is composed of a broken surface of irregularly-shaped segments. The polygonal shaped areas are roughly 12 miles (20 kilometers) across, bordered by what appear to be shallow troughs based on a quick look at the data. The mountain ranges height rival those of the Rockies, says Moore. The new LORRI close-ups show the icy mountain range has peaks jutting as high as 11,000 feet (3,500 meters) above the surface, announced John Spencer, New Horizons science team co-investigator at the media briefing. During the fast flyby encounter, the New Horizons spacecraft pointed its suite of seven science instruments exclusively on all the bodies in the Pluto system, to maximize the capture of scientific data, as quickly as possible, and store it onto its two solid state digital recorders for later playback. A major challenge for the mission is the rather slow “downlink” transmission of data back to Mission Control on Earth. Since the average “downlink” is only about 2 kilobits per second via its two transmitters, it will take about 16 months to send all the flyby data back to Earth. Therefore the team has carefully selected just a few of the highest resolution images and other key instrument data for quick playback. The remaining flyby data will be prioritized for streaming. 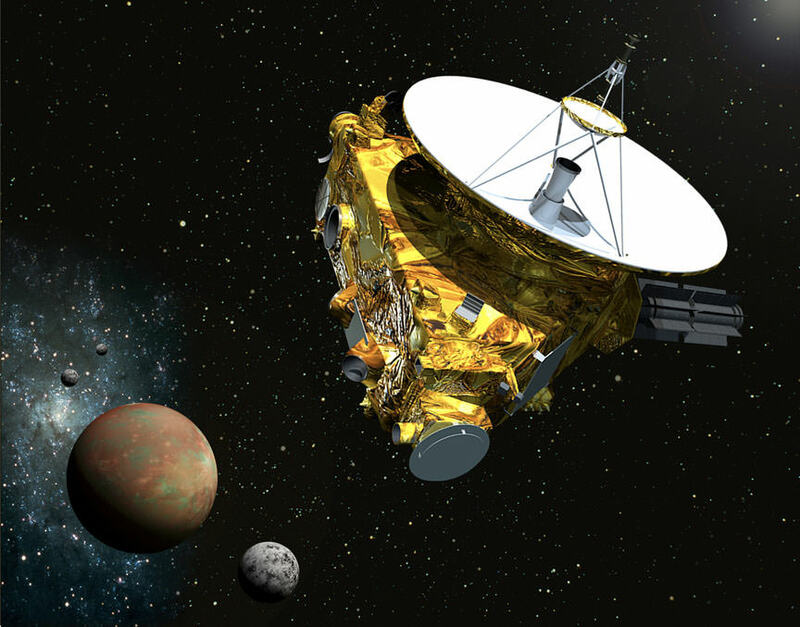 “Over 50 gigabits of data were collected during the encounter and flyby periods,” New Horizons principal investigator Alan Stern of the Southwest Research Institute, Boulder, Colorado, said during the July 17 media briefing. New Horizons discovered that Pluto is the biggest object in the outer solar system and thus the ‘King of the Kuiper Belt’. If the spacecraft remains healthy as expected, the science team plans to target New Horizons to fly by another smaller Kuiper Belt Object (KBO) as soon as 2018. Today (July 11) we got our last, best and clearest look at a quartet of perplexing dark spots on Pluto’s far side from NASA’s New Horizons spacecraft – now just two days and two million miles (4 million km) out from history’s first ever up close flyby of the Pluto system on Tuesday, July 14. The four puzzling spots (see above) are located on the hemisphere of Pluto which always faces its largest moon, Charon, and have captivated the scientists and public alike. Pluto and Charon are gravitationally locked with an orbital period of 6.4 days. Over only the past few days, we are finally witnessing an amazing assortment of geological wonders emerge into focus from these never before seen worlds – as promised by the New Horizons team over a decade ago. Be sure to take a good hard look at the image, because these spots and Pluto’s Charon-facing hemisphere will not be visible to New Horizons cameras and spectrometers during the historic July 14 encounter as the spacecraft whizzes by the binary worlds at speeds of some 30,800 miles per hour (more than 48,600 kilometers per hour) for their first up close reconnaissance. And it’s likely to be many decades before the next visitor from Earth arrives at the frigid worlds at the far flung reaches of our solar system for a longer look, hopefully from orbit. “The [July 11] image is the last, best look that anyone will have of Pluto’s far side for decades to come,” said New Horizons principal investigator Alan Stern of the Southwest Research Institute, Boulder, Colorado, in a statement. The image of the mysterious spots was taken earlier today (July 11) by New Horizons Long Range Reconnaissance Imager (LORRI) at a distance of 2.5 million miles (4 million kilometers) from Pluto, and just released by NASA. The image resolution is 10 miles per pixel. One week ago it was only 40 miles per pixel. They were first seen only in very recent LORRI images as Pluto’s disk finally was resolved and are located in a Missouri sized area about 300 miles (480 kilometers) across and above the equatorial region. But until today they were still rather fuzzy – see image below from July 3! What a difference a few million miles (km) makes! “The Pluto system is totally unknown territory,” said Dr. John Spencer, New Horizons co-investigator at today’s (July 11) daily live briefing from NASA and the New Horizons team. Now, with the $700 million NASA planetary probe millions of miles closer to the double planet, the picture resolution has increased dramatically and the team can at least speculate. “It’s weird that they’re spaced so regularly,” says New Horizons program scientist Curt Niebur at NASA Headquarters in Washington. “We can’t tell whether they’re plateaus or plains, or whether they’re brightness variations on a completely smooth surface,” added Jeff Moore of NASA’s Ames Research Center, Mountain View, California. “It’s amazing what we are seeing now in the images, showing us things we’ve never seen before,” said Spencer. Answering these questions and more is what the encounter is all about. Pluto is just chock full of mysteries, with new ones emerging every day as New Horizons at last homes in on its quarry, and the planet grows from a spot to an enlarging disk with never before seen surface features, three billion miles from Earth after an interplanetary journey of some nine and a half years. “We see circular things and wonder are those craters? Or are they something else,” Spencer elaborated. Until a few days ago, we didn’t know that “the other Red Planet” had a big bright heart and a dark ‘whale-shaped’ feature – see my earlier articles; here and here. “When we combine images like this of the far side with composition and color data the spacecraft has already acquired but not yet sent to Earth, we expect to be able to read the history of this face of Pluto,” Moore explained. The probe was launched back on Jan. 19, 2006 on a United Launch Alliance Atlas V rocket on a 9 year voyage of over 3.6 billion miles (5.7 billion km). Pluto is the last of the nine classical planets to be explored up close and completes the initial the initial reconnaissance of the solar system nearly six decades after the dawn of the space age. It represents a whole new class of objects. “Pluto is a member of a whole new family of objects,” said Jim Green, director of Planetary Science, NASA Headquarters, Washington, in today’s live Pluto update. New Horizons is equipped with a suite of seven science instruments gathering data during the approach and encounter phases with the Pluto system. Latest color image of Pluto taken on July 3, 2015 shows 4 mysterious dark spots. Despite some hair-raising and unplanned 4th of July fireworks of sorts in deep space which caused NASA’s Pluto bound New Horizons spacecraft to enter “safe mode” due to a computer glitch and temporarily halt all science operations over the weekend, the spacecraft is now fully back on track, “healthy” and working “flawlessly” and set to resume all planned research investigations on Tuesday, July 7, NASA and top mission managers announced at a media briefing held this afternoon, Monday, July 6. It’s now just exactly one week before the once-in-a-lifetime opportunity for a fast flyby encounter of the ever intriguing binary planet, at the far flung reaches of the solar system. And the great news could not come soon enough given the proximity of the flyby. “The spacecraft is in excellent health and back in operation. New Horizons is barreling towards the Pluto system,” stated Jim Green, director of Planetary Science, NASA Headquarters, Washington, at the start of today’s news media briefing. The $700 million mission remains on track to conduct the complex close flyby science sequence in its entirety, as planned over the next week, including the July 14 flyby of Pluto, despite the scary safe mode episode. “The New Horizons spacecraft and science payload are now operating flawlessly,” Alan Stern, New Horizons principal investigator, Southwest Research Institute, Boulder, Colorado, announced at the media briefing. NASA unexpectedly lost contact with the New Horizons spacecraft on Saturday, July 4, at about 1:30 p.m. EDT after it suffered a memory related software anomaly and executed a protective operation known as “safe mode.” An anomaly investigation team was formed immediately. “It’s really a historic time, but also fraught with many decisions and challenges on the way to the July 14 Pluto system encounter,” Green said. The mission team quickly worked to reestablish contact with the piano shaped spacecraft about 90 minutes after the signal was lost. The team worked tirelessly and diligently day and night over the holiday weekend to recover New Horizons back to full operation quickly and in time for the flyby encounter of Pluto on July 14, set for approximately 7:49 a.m. EDT (11:49 UTC) on July 14, said Glen Fountain, New Horizons project manager, Johns Hopkins University Applied Physics Laboratory, Laurel, Maryland. The software glitch occurred a day after new operating software was uploaded to New Horizons last Friday. The spacecraft was trying to do two things at once on Saturday, compressing science data and writing command sequences while using up too much flash memory, explained Fountain. “The computer was trying to do these two things at the same time, and the two were more than the processor could handle,” Fountain said. At this moment New Horizons is about 3 billion miles (4.9 billion km) from Earth and less than 6 million miles (9 million km) away from unmasking the secrets of tantalizing Pluto, Charon, its largest moon with which it forms a double planet system, and its four tiny and recently discovered moons. Charon is half the size of Pluto. The round trip time for signals traveling at the speed of light is 8.5 hours. So it’s a very long time before commands from Earth can reach the spacecraft and for the team to determine their outcome. So the probe has to be able to operate on its own without direction from Earth during the intense and brief flyby period. Pluto is the most distant and last unexplored planet in our Solar System, and therefore presents enormous complexities to those bold enough to dare the mightiest things. “We expect a nominal flyby of Pluto from every indication now,” said Alan Stern, New Horizons principal investigator, Southwest Research Institute, Boulder, Colorado, announced at the media briefing. Less than 1 percent of the planned data was lost in the three days that the science instruments were shut off. “It’s more important to focus on the later science during the flyby,” Stern elaborated. “There is zero impact to the primary Group 1 highest-priority science objectives. And a minor impact to Group 2 and Group 3 objectives,” Stern elaborated. The team said this type of software update will not be repeated and a similar type safe mode event should not recur. Fountain said that during the encounter period, the probe can switch itself to exit safe mode event within about 7 minutes, depending on the situation, and minimize any science data losses. New Horizons will swoop to within about 12,500 kilometers (nearly 7,800 miles) of Pluto’s surface. It will zoom past Pluto at speeds of some 30,000 miles per hour (more than 48,000 kilometers per hour). Today the team also released the best yet images of Pluto that were taken by the Long Range Reconnaissance Imager (LORRI). The trio of images were between July 1 and 3 of 2015, prior to the July 4 anomaly that sent New Horizons into safe mode. The images show varying and enigmatic surface features on the different hemispheres of Pluto. They also show the four mysterious dark spots on Pluto that have captured the imagination of the scientists and the world. Their nature remains unknown at this time. The probe was launched back in 2006 on a United Launch Alliance Atlas V rocket. “We are on our way to Pluto!” Green exclaimed.